Menu. Use the menu to load, save and clear patterns and specify various editing options. 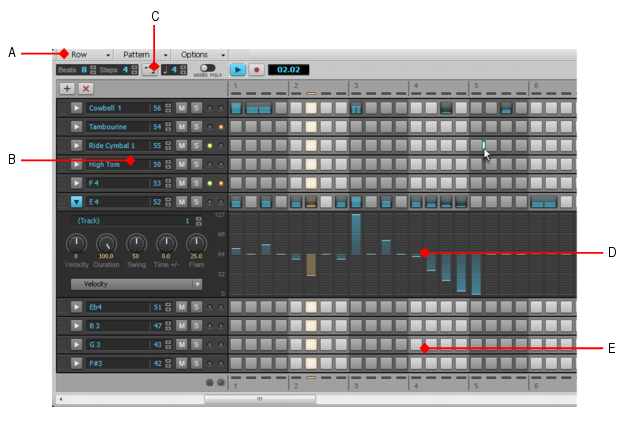 For details, see Step Sequencer view menu. Toolbar. The toolbar contains transport controls and lets you specify the pattern length and behavior when inputting new notes. For details, see Toolbar. Rows. Each row represents a unique pitch, and has its own independent group of controls. You can insert, delete and reorder rows. For details, see Rows and Working with rows. Notes pane. The Notes pane is where you turn notes on and off to create a pattern. For details, see Notes pane and Working with steps. Controllers pane. The Controllers pane is where you can create modulation events, such as Controller, Pitch Wheel, Channel Aftertouch, RPN and NRPN. For details, see Controllers pane and Working with Controller events. Figure 644. Step sequencer interface.